Property Size 1,409 sq. ft. This spacious home is filled with character and charm, perfect for a fun filled San Diego family vacation. The moment you walk through this home's 19th century antique front door, you will love the cozy and comfortable atmosphere with vaulted ceilings and stained glass windows. This beautifully furnished, 2 bedroom, 2.5 bathroom home comes with 3 flat screen TV's, an office, WiFi, fully stocked gourmet kitchen, large spacious garage, laundry room and beach toys for you to use. There is plenty of space to relax outside in the sun or shade with your cup of morning coffee or evening glass of wine. 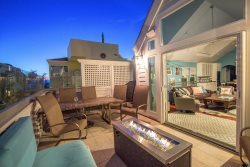 Located in the heart of Mission Beach, this home is just steps from wonderful restaurants, the beautiful bay, and tons of shopping! The property was extremely well maintained, plenty of room for the 7 of us. It was located in between the beach and The Bay, perfect for our trip to experience both sides of the water. The Management company, luv surf vacations, was extremely friendly throughout the entire transaction and throughout our stay to ensure we had everything we needed. They left extensive instructions on how to handle all situations, very helpful! Recently stayed with my best friend and her daughter, and couldn't have been happier! Excellent location, decor and amenities. Exactly as pictured, but pictures don't do it justice. We will be renting this exact beach house again, without a doubt. Proximity to everything is fabulous, easily walked to Belmont Park in 1 direction & Baked Bear in opposite direction. Highly recommend, just don't rent when we want to. Amenities (included but not limited to): HD flat screen TV's, DIRECTV programming, wireless Internet, fireplace, fenced-in front patio, 3 balconies, second level balcony deck with BBQ, stainless steel appliances, granite countertops, fully stocked kitchen, fresh coffee beans, grinder, and coffee maker, attached spacious garage, all linens, towels, shampoo, conditioner, body wash, and lotion, blow dryers, high chair, pack n' play, boogie boards, bikes, beach toys, beach chairs, beach umbrella, and dog food, bowls, bed, treats & toys.